Senior Years at Fountainhead comprise of Grade 11 and Grade 12. For Senior Years, the school offers globally accepted International Board of Education – Diploma Programme (DP) of International Baccalaureate (IB). The school has the affiliation with International Baccalaureate Organization (IBO) for IBDP Programme. Fountainhead prepares students for successful college experience by engaging in a challenging course of studies. FS provides students with the values, skills, and experiences that will allow them to be competitive applicants for the university. What is IB Diploma Program? The International Baccalaureate® (IB) is a non-profit educational foundation, motivated by its mission, focused on the student. Their 3 programmes for students aged 3 to 19 help develop the intellectual, personal, emotional and social skills to live, learn and work in a rapidly globalizing world. Founded in 1968, they currently work with 3,664 schools in 146 countries to develop and offer four challenging programmes to over 1,133,000 students aged 3 to 19 years. The IB continuum of international education is unique because of its academic and personal rigor, challenging students to excel in their studies and in their personal growth. The IB Primary Year Programme, for students aged 3 to 12, focuses on the development of the whole child as an inquirer, both in the classroom and in the world outside. The IB Middle Years Programme, for students aged 11 to 16, provides a framework of academic challenge that encourages students to embrace and understand the connections between traditional subjects and the real world and become critical and reflective thinkers. At Fountainhead we offer all 3 Programmes – Primary Year Programme (Nursery-Grade 6), Middle Years (Garde 7 & 8) and Diploma Programme (G 11 & 12). 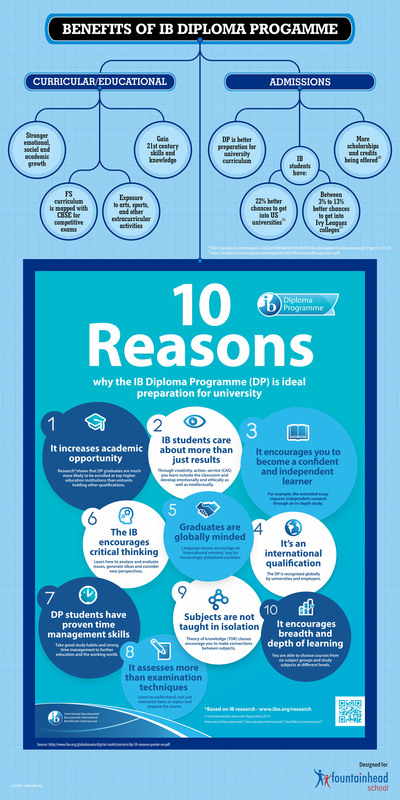 What is the IB – Diploma Programme? The International Baccalaureate Diploma programme is a two-year rigorous and prestigious pre-university qualification for students aged 16-19 years. This Diploma has gained recognition and respect from the world’s leading universities. The IBO is a recognized leader in the field of international education, encouraging students to be active learners, help develop critical thinking skills, be well-rounded individuals, acquire skills to learn and work in a rapidly globalizing world. Introduced in the year 1968 in Geneva, Switzerland by the INTERNATIONAL BACCALAUREATE ORGANIZATION, it is taught and recognized in 146 countries across the Globe to over 1,133,000 students. What is unique about IBDP? The IB Diploma Programme (DP) is an academically challenging and balanced programme of education. It has been designed to address the intellectual, social, emotional and physical well-being of students. The Diploma Core programme (extended essay, CAS, and Theory of knowledge) makes the IB programme unique. Why should I select IBDP for my child? The IB Diploma has earned a universal reputation for rigorous assessment, giving students access to the top colleges and universities in India and the world. IB is fast becoming the program of choice for Indian students preparing to pursue higher education abroad. IB develops the skills and a positive attitude toward learning that will prepare them for higher education. It helps students make connections across traditional academic disciplines and explore the nature of knowledge through the programme’s unique theory of knowledge course. IBDP enhance student’s personal and interpersonal development through creativity, action, and service. Is Diploma Programme too hard for students who are not academically inclined? The IB is designed as a model of holistic education for the midrange student and above. Statistically speaking, most students who have earned the IB Diploma worldwide were of average or above average ability. It is not a program designed only for geniuses. What the IB program requires students to have are a strong work ethic, good time-management, and solid study skills. The IB program offers courses at different levels (Higher Level and Standard Level). In addition, language courses range from introductory level to native-speaker level. Although the student who has passed through PYP has a better understanding, it can be taken independently also. A student can join the IB Diploma Program after completing the grade 10 level qualifications from CBSE, ICSE or any other State Board.The Diploma Program is equivalent to 10+2 level qualification through CBSE or through any other Indian board. Is the IBDP recognized in India and worldwide? The Association of Indian Universities (AIU) rates the IB Diploma at par with Class 12 CBSE, ICSE or State Boards. Many educational institutions and colleges have published their policies and entry criteria for IB students on their websites. IB Diploma students may be offered credit (particularly for Higher Level courses and TOK) for first-year university courses in Canadian and American Universities overseas. What is the University Recognition of the IB DP like? The IB works closely with universities in all regions of the world to gain recognition for the IB diploma. 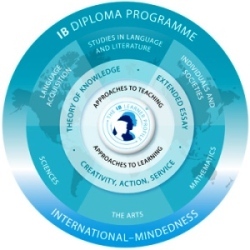 The IB Diploma is regarded highly for entry into universities throughout the world and for advanced placement at many colleges and universities. IB diploma is recognized in India by AIU (Association of Indian Universities). However, there is a time overlap. IBDP results come out in July whereas most colleges seek applications in June in India. The IBO authorities issue an equivalent mark sheet to Indian students with percentage score per subject mentioned so as to avoid confusion when students seek admission in Indian universities. Please refer to the Guide for University Admissions in India for the list of universities which have policy statements accepting IB students. How do IB students fare in college acceptance? INTERNATIONAL: As per the statistics available, an IBDP student with 37 and above points (maximum possible being 45) accumulates good enough credits to get admissions in the best universities around the world. Students with a score lower than 37 (say in the range of 31 to 36) are also well accepted in Universities worldwide. (24 is the normal passing aggregate and each subject has a score range of 1 to 7 with 1 (lowest) to 7 (highest). The acceptance rate of IB students into Ivy League institutions (Princeton, Yale, Brown, Harvard, Columbia, Cornell, Dartmouth, and University of Pennsylvania) is between 3% and 13% higher compared to the total population acceptance rate. INDIA: The Association of Indian Universities (AIU) recognizes IB DP as a qualifying secondary school diploma for admission to Indian universities. The AIU also has a conversion formula to convert the IB grading scale (1 to 7) into percentage equivalents. have been done for equivalence of IB Diploma Programme Qualifications. 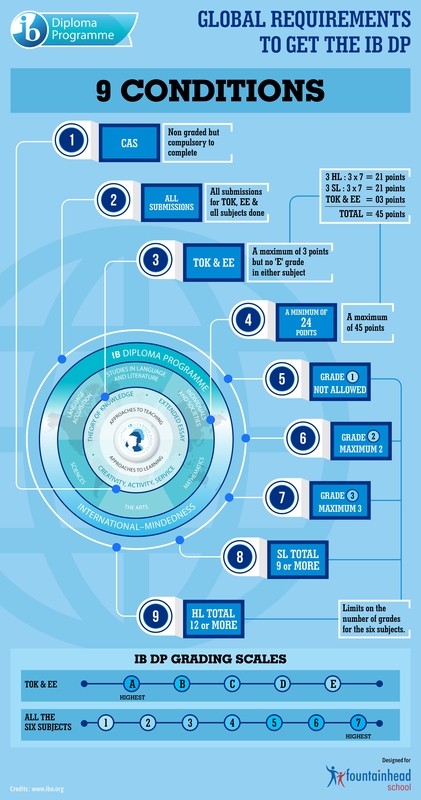 What is the structure of the curriculum for the IB Diploma Programme? IBDP students study three subjects at ‘Higher Level’ (HL) and three at ‘Standard Level’ (SL). They study HL subjects for a greater number of hours (240 teaching hours) and in greater depth than SL subjects (150 teaching hours). The extended essay: Students need to undertake original research to produce an Extended Essay (EE) of maximum 4,000 words. The extended essay offers the opportunity to investigate a topic of special interest with independent research work and writing skills. Theory of knowledge (TOK): TOK is a course designed to encourage each student to reflect on the nature of knowledge by critically examining different ways of knowing (perception, emotion, language, and reason) and different kinds of knowledge (scientific, artistic, mathematical and historical). Creativity, action, service (CAS): CAS programme encourages students to be involved in artistic pursuits, sports and community service work, thus fostering students’ awareness and appreciation of life outside the classroom. How many subjects are students expected to take? A student is expected to take a total of 6 subjects, with 3 subjects at the Higher Level and 3 subjects at Standard Level + Theory of Knowledge (TOK), Extended Essay (EE) and Creativity, Action, and Service (CAS). Students must choose one subject from each of groups 1 to 5, thus ensuring breadth of experience in languages, social studies, the experimental sciences, and mathematics. The sixth subject may be an arts subject chosen from group 6, or the student may choose another subject from Experimental Science, or a second Individuals and Societies subject. How do students decide which subjects to take? Students can decide subjects as per their interest, areas of strength, career choice and university requirements for India and other countries. IB believes that until high school level it is very important to develop a wide knowledge base and thus IB maintains adequate breadth in the curriculum. Whatever career one eventually pursues in life, some bit of math or science or understanding of humanities is necessary to manage world/one’s own affairs and be successful in life. While making a minimum choice from each discipline mandatory, IB offers multiple options within each group to accommodate individual preference and future academic/professional needs) e.g. there are three Math levels on offer; the Sciences group includes subjects such as Environmental Systems and Society. Can you take 3 Sciences (Physics, Chemistry, and Biology) in the DP? Yes, it is possible to do so by. Students need to take prior approval from IB to get three sciences for the admission in the specific undergraduate course. If a student opts for 3 sciences it would come with a non-regular diploma (which is very much a full diploma structured differently). A non-regular diploma should only be requested if it is related to university entrance requirements or government norms. The application has to be put up with the IB at least 18 months in advance. The evidence provided must show that the university in question is asking for the specified subject combination. If evidence is not provided, the request will not be considered. Why do we have 3 sciences (physics, chemistry, biology) at the HL level? Taking these subjects at the SL level would not serve the purpose for most of the popular science-related careers such as engineering, medicine as top universities in India and abroad require HL in the subjects. If a student has not taken science earlier, can s/he cope up with an HL subject? If a student wants to study science at a higher level than some previous exposure to the specific subject would be necessary. Students who have undertaken the IB Middle Years Programme (MYP) would be well prepared. Other national science qualifications or a school-based science course would also be suitable preparation for the study of a group 4 subject at HL. Is it compulsory to take a language in group 2 or can we skip it? Why have we chosen Visual Arts as the only arts offering? And why is it at HL? All the other options require an in-depth technical understanding of the subject which we are unable to offer at this point in time. Furthermore, most students who want to take a subject in group 6, are likely to take up Visual Arts. Further, if you are looking for VA as a career option then you should go to VA HL as SL will not serve the purpose from a career viewpoint. The course content of IB DP for the Sciences and Mathematics is in line with the prescribed syllabus of all India open entrance tests for Engineering or Medicine undergraduate studies. All IIT’s and other specialized institutes recognize IB. The DP would cover some of the topics but not all the topics or in the same way as required for entrance examinations. For entrance exams such as the JEE, students will require extra coaching. Do universities mention their requirements for subjects? Yes, many universities mention explicitly the subjects that they wish or the overall score or the level of the subject offering (HL/SL). The table gives a very general guideline for universities requirements. Note: This list is not exhaustive and some combinations may not be offered. How does an assessment in the DP look like? IB assessment is rigorous, criterion-related, consistent and differentiating of student ability. Diploma Programme assessment includes both final examinations and internal assessment undertaken by the teacher to IB criteria and then externally moderated by the IB. Marks awarded for each course range from 1 (lowest) to 7 (highest). The diploma is awarded to students who gain at least 24 points. Diploma Programme students generally take six examinations, including one literature course taught in the student’s native language, one foreign language, one social science, one experimental science, mathematics and one arts course. The arts course can be replaced by a second social science, a second experimental science, or a third language. Students take their examinations at the end of the two-year Diploma Programme. In which month does the IBDP conduct exams? IBDP exams are conducted in the month of May and November session. At FS we will have the session in May. Are there practical examinations in the DP? There are regular internal assessments happening. 20-25 % weightage is given to the experiments which need to be done during the 2-year program from which student can choose best of their work to be sent to IBDP. How do the grading for TOK, EE, and CAS work does and what weightage does it cover? The basic understanding is required for these subjects. You will get 1 mark if the understanding is clear or else get 0. In case you get 0, you will not get a diploma. The overall mean score is 35 and minimum score required for this is 24. How is the overall scoring (grading system) being done in IBDP? How do they convert grades into the percentage? Page 20-23 of the below-mentioned link has a sample transcript in order to give an idea of conversion of IB grades into the percentage. Does a grade-based marking put IB students at a disadvantage for college admissions vis a vis their peers from Indian national systems that offer percentages? 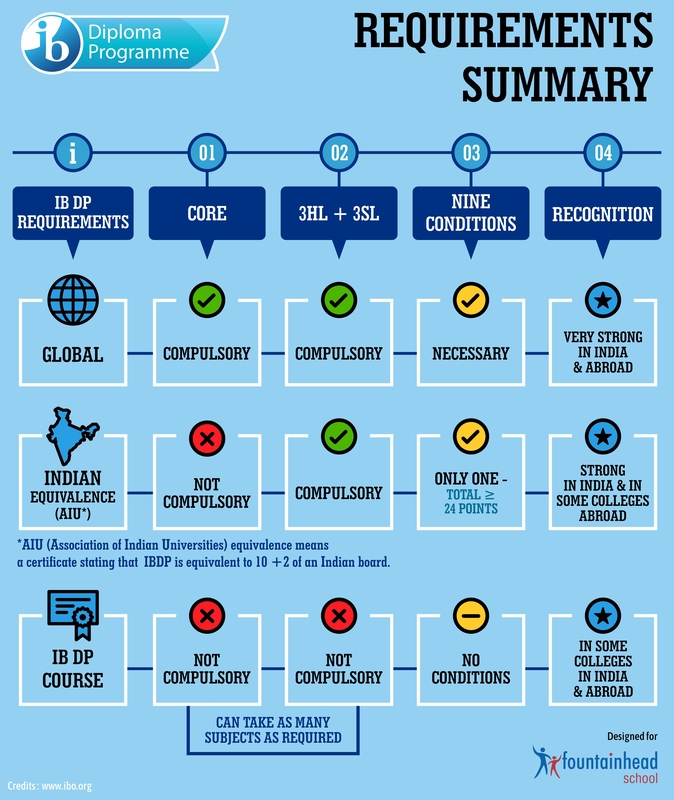 Are there any exceptions made for IBDP students to gain admissions in Indian Colleges? Does the grading percentage criterion change every year? Yes, it differs from subject to subject and changes on a yearly basis. The determination of grade depends upon the difficulty level of the paper, the performance of the students and the specific subjects. What if DP exam and entrance exam clashes? The DP examination schedule is sent well in advance. And the IB offers flexibility in exam timings. It can be adjusted accordingly but that has to be approved by the IBO. When are the examination results made available? Examination results are sent out in July beginning for the May session. For admission to Indian universities, provisional certificates will be issued by the school which is accepted by many universities. How does the late declaration of IB results affect the students who would want to continue further education in India? IBDP results are published on about the 5th of July each year for its May examinations. The admission process in Indian Colleges is on till about the third week of July. However, by 5th July, the 1st list of most colleges is out. However, all IB DP students are assigned a “Predicted Grade” before sitting for the examinations. The accuracy of this predicted grade vis a vis actual grade (in a variance of +/- 1) is about 93%. Provisional admissions are granted to IBDP students based on the predicted grades which are confirmed upon submission of the final grade. While in Universities such as the University of Mumbai, this phenomenon is accepted universally at University level, in places like the University of Delhi, the student/ parent has to pursue individually with the respective college. What if the IBDP results are announced late for university admission? DP is working towards increasing the acceptance of the predicted grades. Abroad the provisional certificates are totally acceptable. In, India also mostly universities are accepting this. IB is working hard so that Indian Universities accept predicted grades. Also in India, Mumbai University grants admission on the basis of predicted grades. Further, the IB is also making an attempt to ensure that results are released earlier than 5th of July. The IB is not a substitute for these standardized university entrance tests. Most US universities require the SAT-1 (math & verbal ability) test; many also require the SAT-2 (individual subjects) test. Most universities in the U.S., Canada, and Europe require proof of adequate English ability for non-native speakers of English, through the TOEFL exam. What is a “gap year” or a “year off” or a “third-year option”? Not going on to university immediately after finishing schooling. A “gap year” or a “year off” is an excellent opportunity to take a break from studies, gain valuable work experience or volunteer experience, and strengthen your resume for university applications thereafter. Unlike in India, in most places in the world, this is not seen as “losing a year” but rather gaining valuable non – academic experience and an opportunity to further discover one’s own strengths and preferences before making choices for university courses. Yes, they often do. Since the IB standard is considered to be quite high, many US Universities offer advance credits (or advanced standing) in well-scored subjects in IB DP. A good student can accumulate these credits to save up to one full year of the four-year undergraduate program. The exact amount of credit awarded varies from university to university.